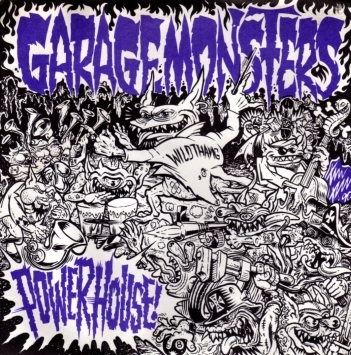 JG Thirlwell | Garage Monsters: Powerhouse! RECORDED AT CHATEAU DU EMBRYONICUSS, NY FALL-1989. Face A: SING A SONG OF JACKHAMMERS, BULLDOZERS & SATAN. A collaboration between Clint Ruin, and The P!zz (noted skater artiste) and Buttstain. As Thirlwell related it, The P!zz and Buttstain would describe sounds and Thirlwell (Ruin) would create them, although this is more of a cover than an original composition. Outer sleeve, label design (3 different known label designs and was pressed on barely translucent dark grey vinyl. ), and etching artwork by The P!zz. “Powerhouse!” originally by The Raymond Scott Orchestra, recorded 20 Feb, 1937. and also appears in the same format on the Steroid Maximus Gondwanaland release. Clint Ruin’s latest all-instrumental mood-piece (he’s usually busy as Foetus/Lydia Lunch’s squeeze) turns up in a stellar package (there are some fanciful etchings on the flip side) and would prove a fitting, if over-accelerated, accompaniment to a Fritz Lang film or Ayn Rand adaptation. It glistens with noir, synthetic hipster beats, jazzily robotic pseudo-horns and is immersed in swing-era bustle-starting fast and swishing breathlessly toward an atomic-age conclusion. CMJ New Music Report, Issue# 194 (27 Apr 1990), author unknown.